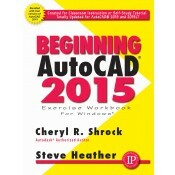 This is the right book for users if they’re new to AutoCAD or want to brush up on the basics, they’re looking for a clear, no nonsense, easy-to-follow text, or they want to learn AutoCAD quickly and easily. All exercises print easily on a standard 8 ½” x 11” printer. The “New Tab” page containing two sliding content frames – Learn and Create, enabling you to quickly access recent drawing files, templates, product updates and online resources. Graphics Performance dialog box making it easier to change graphics settings. Lasso selection giving greater control when selecting objects. Totally updated for AutoCAD 2015 and 2015 LT. Improved Features include … Enhanced Status Bar giving greater control on the tools you want displayed; Reorganized View Ribbon making it easier to control the visibility of the UCS Icon, Navigation Bar, ViewCube and Layout Tabs; and Improved graphics with Line Smoothing. AutoCAD 2015 30-Day Trial Version included on the enclosed DVD.